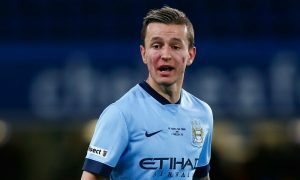 Manchester City youngster Bersant Celina is attracting the attention of German giants Borussia Dortmund, according to a report in The Sun. Dortmund have had scouts monitoring the Kosovo international, who is on loan to FC Twente for the season along with fellow City starlets Enes Ünal and Yaw Yeboah. The 20-year-old midfielder has made a positive start to life in the Eredivisie with 3 goals in 4 league games. The Dutch league is a famous developmental area for young talents and Dortmund scouts have been impressed by the skillful midfielder. Pep Guardiola is reportedly a fan of Celina, who made two first-team appearances last season, but Dortmund may try to entice him to Signal Iduna Park with the promise of more regular first-team football than he is likely to find at City. Celina signed a new four-year deal in May, tying him to the club until 2020, and it would take a tempting offer for City to part with one of their brightest young players.